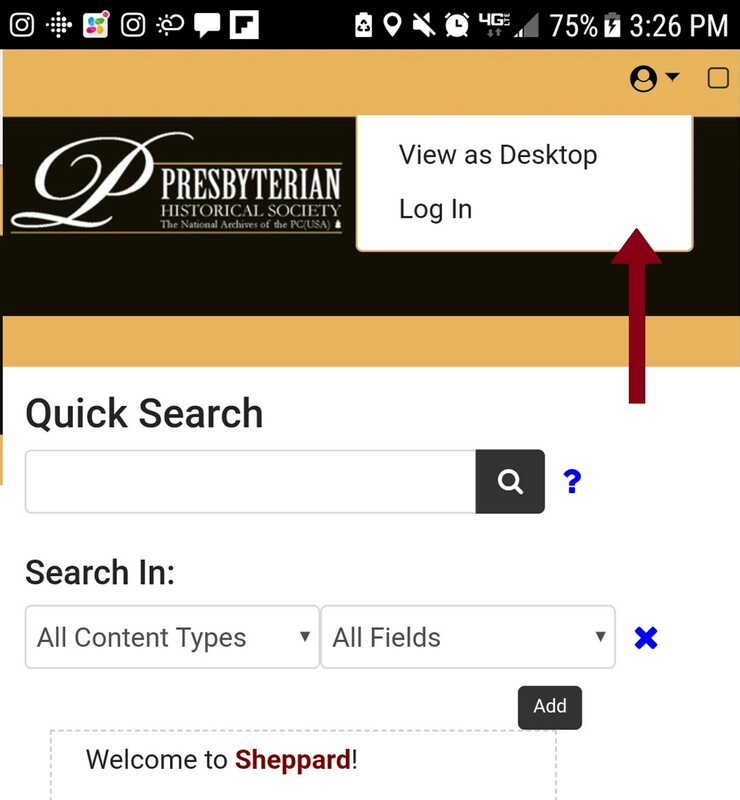 We are pleased to announce the launch of Sheppard, a new search tool that gives you one-stop access to seven different databases that describe PHS collections. Sheppard is named in honor of William H. Sheppard (1865-1927), a Presbyterian minister and missionary to the Congo. Sheppard was the first Presbyterian Church in the U.S. African American missionary, and helped raise awareness of the atrocities perpetrated by King Leopold II’s colonial administration against natives in the Congo Free State. The name also puns on “shepherd,” caretaker and guide of a flock. 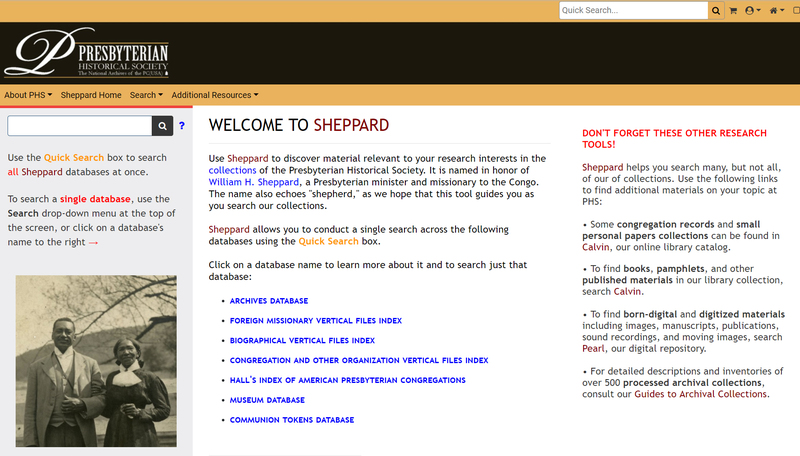 We hope that Sheppard serves as your trusted guide as you navigate our collections. To access Shepherd, visit the Collections section of the PHS website, or bookmark its URL, http://prestohost68.inmagic.com/Presto/home/home.aspx. Sheppard is a federated search tool, which is library- and-archives- speak for saying that you can search multiple databases at once. It’s like having to go to only one store to pick up ingredients for dinner, rather than run around town to many different shops. Archives database, which describes PHS holdings of personal papers of Presbyterian ministers, mission workers, and other individuals; and institutional records of congregations, presbyteries, synods, national agencies, and affiliated organizations. Due to denomination policies, not all of our archival holdings are visible in Sheppard: currently, you can search for small personal paper collections and congregation records. We will be making more collections discoverable in the future. Indexes to the Foreign Missionary, Biographical, and Congregation vertical file collections. These collections consist of folders of miscellaneous materials about Presbyterian foreign missionaries; ministers and other important people; and congregations. Hall’s Index of American Presbyterian Congregations, which tells you when congregations were established, changed names or locations, merged, dissolved, and so on. Museum database, which describes PHS holdings of material objects manufactured in the United States and abroad, including gavels, fine art, textiles, and objects from the mission field. Sheppard includes images of museum objects when they are available. Communion Tokens database, comprised of more than 4,500 descriptions of communion tokens from the United States, Scotland, Ireland, and other countries. The Archives, Museum, and Communion Tokens databases are accessible for direct searching by all users for the first time in Sheppard. To give an example of the benefits of federated searching, imagine that you are researching the life of Ben Weir (1923-2016), Presbyterian missionary, former hostage, and moderator of the 1986 General Assembly of the Presbyterian Church (U.S.A.). We have quite a bit of material related to Ben in various collections, including foreign missionary vertical files for both Ben and his wife, Carol Swain Weir; a biographical vertical file on Carol; Ben’s personal papers; the papers of other missionaries in Lebanon that include material about Ben; and artifacts related to his tenure as General Assembly moderator. Sheppard offers a number of ways to manage your search results, including sorting them by different criteria, increasing the number of hits that you see on one page, and using the “facets” that appear on the left-hand side of the screen to narrow your results. Use the icon toolbar on the left-hand side of the screen to print, email, or download records. We are excited about Sheppard and all the features it offers to make it easier for you to discover materials at the Society! Please note, however, that even Sheppard cannot contain the full richness of our collections. 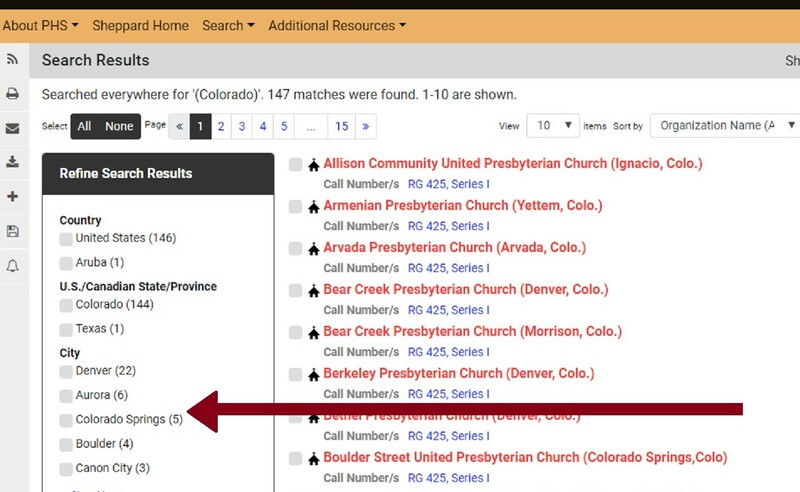 To find descriptions of published materials and some congregation records, you should also search Calvin, our online library catalog. To find digitized versions of documents, photographs, motion pictures and sound recordings, check out Pearl, our digital archives. And for highly-detailed descriptions of more than 500 processed archival collections, visit our online Collection Guides. And of course, if you need help or would like to schedule a visit once you have identified materials you are interested in using, please contact our Reference Desk. Happy searching! 14 hours 7 min ago. Today’s #HistoricalFigureFriday honors Reverend James Patriot Wilson. Born in 1769 in Lewes, Delaware Wilson went on to graduate from the University of Pennsylvania in 1788. He initially studied law and was admitted to the Bar but the unexpected death of both his wife and brother led him to a religious path. He was ordained as pastor of the Presbyterian Church in Lewes in 1804 and in 1806 he accepted a call to lead the First Presbyterian Church in Philadelphia. He resigned as a much celebrated pastor in the spring of 1830 before he died December 9th 1830. Our portrait of Reverend Wilson was painted in 1807 by none other than James Peale the younger brother of Charles Willson Peale. This oil on canvas painting represents one of the many large portraits James Peale completed after he shifted away from miniatures. To see more works by James Peale visit PAFA The Pennsylvania Academy of the Fine Arts or the Philadelphia Museum of Art.